I clean out my closet fairly often, since I don’t have much room for clothes and therefore can’t keep items that don’t fit or that I don’t wear. I’ve been more or less the same size since high school, so I’ve got a few items that are pretty old, and it’s funny to trace my evolution through my fashion choices. I still have the olive green corduroys with butterflies on the back pockets that a friend persuaded me to buy in college with money that really should have gone toward things like printer paper and food. I still fit in them because I habitually buy frivolous items with money that should have gone toward food. They’re actually a little big on me now, but it’s okay because I’m much more likely these days to slouch around a park in the afternoon than to go to a party. Just as well to have the extra room. It’s hard to slouch effectively in tight pants. Then there are the lace-up black ankle boots that I fell in love with fifteen years ago and had to have, and that I still wear because they have brilliant rubber soles with tread in addition to three-inch spike heels, and I’m convinced I could outrun attackers, defuse the bomb and save the boy when I’m wearing those boots. I can wear them just about anywhere, in any setting. I’ve gone hiking in them, and I’ve gone to church in them. Other boots have come and gone, but the black ankle boots remain, and are a pretty good metaphor for who I am. 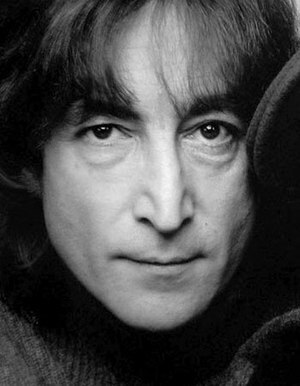 But I think my favorite item of clothing is a T-shirt that I stole from my big sister, a T-shirt of John Lennon in NYC. It’s as old as I am, thin as tissue, with holes in areas that necessitate wearing it with another shirt underneath if I’m going out in public. It’s authentic vintage and definitely the coolest piece of clothing in my closet. Cooler than the jacket that looks like leather but is actually animal-friendly and washable, cooler than the gold silk skirt that will always look classy no matter what’s in style, cooler than the classic white button-down blouse my mother got me when I landed my first grown-up job. Of course, it’s that much cooler since I had to filch it from my sister’s drawer when she was still living at home! Sorry, Big Sis. I love you, but we’re talking John Lennon here. These days I mostly buy suits and pantyhose, with the occasional pair of neutral-colored slacks and a tasteful selection of work-appropriate shirts. But back in the day, I rocked torn jeans and a vintage tee. Sometimes I still do, on the weekends. Maybe I’ll drag Johnny out tomorrow, hit a few bars, and see if I get carded. 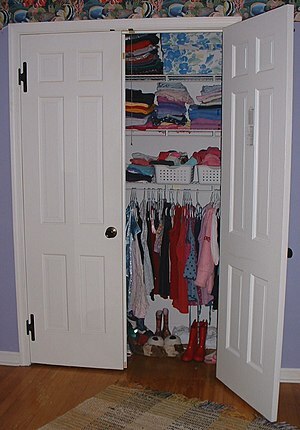 Like I said at the beginning of this post, I don’t have room to store clothes I don’t wear!